This is a sponsored post written by me on behalf of Nature Nate’s 100% Pure, Raw & Unfiltered Honey. All opinions are 100% mine. Did you know it’s National Honey Month?! Which means it’s the perfect time to sweeten up your diet with a little honey, one of the most delicious natural sweeteners out there! 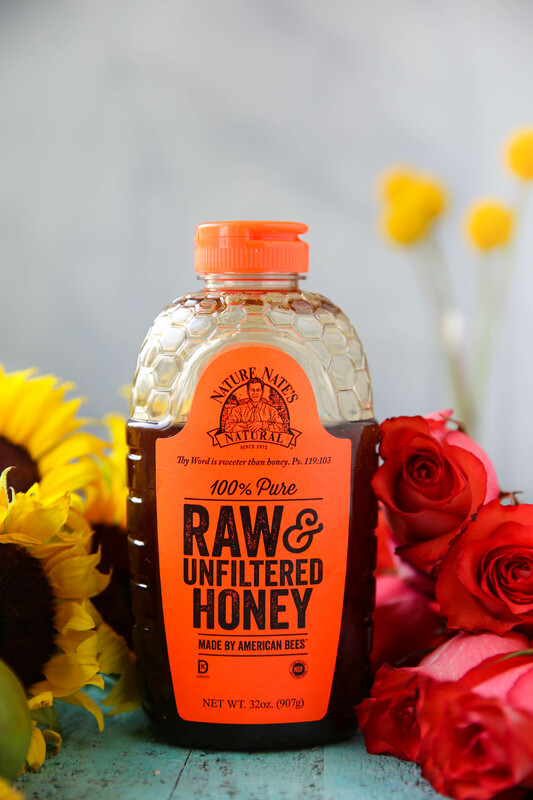 There are so many different sweeteners on the market nowadays, but honey is a natural alternative to the processed sugars and artificial sweeteners, that tastes delicious in pretty much anything! To celebrate Natural Honey Month, I’ve created three easy recipes that you can add into your daily routine. And if you’re using Nature Nate’s Honey like I am, you’ll get the added benefits like extra vitamins, enzymes and nutrients that you can’t find in any processed sweetener. Plus it’s incredibly versatile. You can add it to drinks, bake with it, put it in dressings or marinades and you can even create your own skincare products with it. I personally haven’t because I don’t trust myself to not eat it directly off my face, but you could totally do that if you have self control (unlike me). Think about what you add sweetener to every day – Is it your morning cup of coffee? Or an afternoon snack? Or a treat? Whatever it is, honey is a great alternative that is easily accessible and packed with good stuff! And Nature Nate’s honey is raw, unfiltered, and 100% pure honey. Nothing but the good stuff in each bottle! And Nature Nate’s can be purchased at most major and regional retailers. So today I’m showing you how I incorporate their honey into my daily routine! First I have an iced coffee blended with honey, then a snack that I have been loving in the afternoon lately, and a dressing that goes amazing on salads, chicken and is a great marinade for steak! First up…since it should always be first…iced coffee! If you’re anything like me and like to enjoy your life, you like a little sweetener in your coffee. 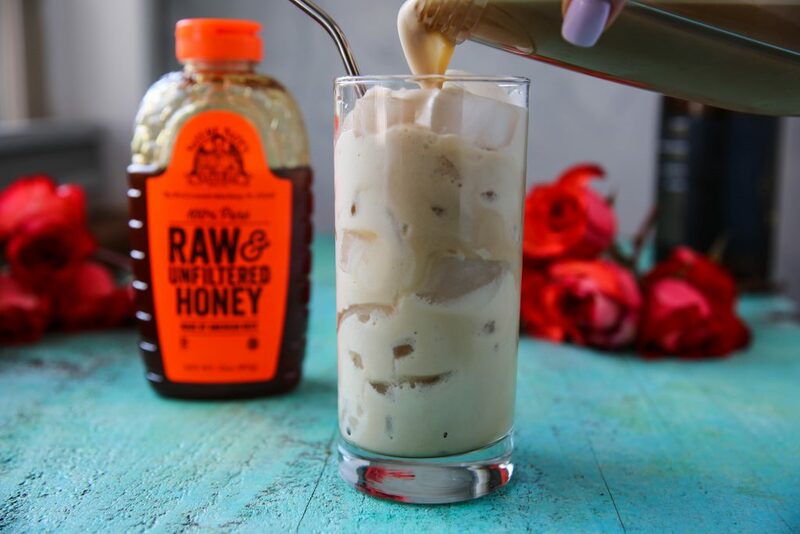 And honey is the perfect alternative to sketchy processed sugars that will sweeten up your coffee a perfect amount without overpowering the drink. Place all ingredients in a blender and blend until combined. Now for an afternoon snack! I’ve been eating this yogurt bowl every single week lately and LOVING it! I’ve even shared it on my IG stories a few times. It’s creamy, slightly sweet and has the perfect amount of crunch! It’s the best snack to help power you through the rest of your day, without weighing you down! Place all ingredients in a bowl and mix to combined. 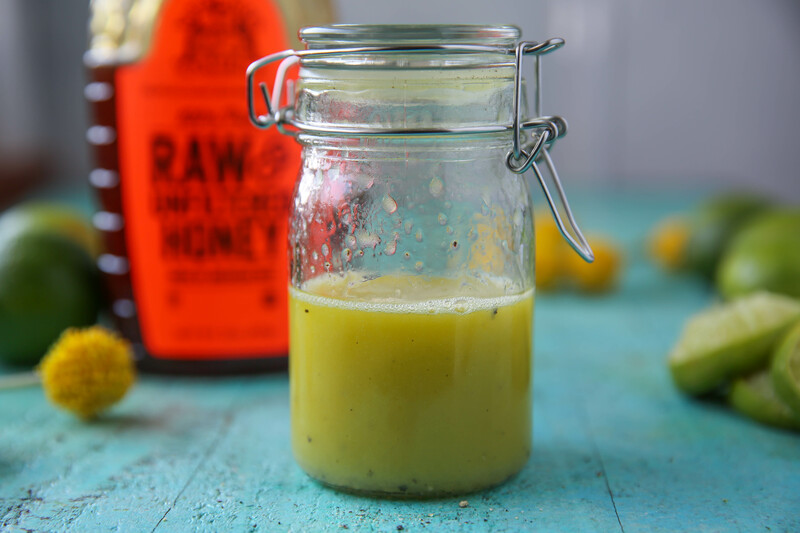 Last but not least, the perfect honey lime vinaigrette! This dressing is delicious on salads, it goes great over grilled chicken and I even used it to marinate my steaks last week before pan searing them. And you can keep this in your fridge for a week and use it whenever you see fit! Place all ingredients in a jar and shake until completely combined. Nature Nate’s Honey cares about what goes into each bottle which means they concentrate on sustainability, partnering with responsible beekeepers and giving back to their communities. Their honey bottles and packets are 100% recyclable and BPA free. And all waste materials generated on-site are recycled, including all boxes, packaging materials, paper, bottles and caps! And since their honey is raw and unfiltered, all they have to do is simply warm then strain it in into bottles so all that is left behind is delicious, pure honey. 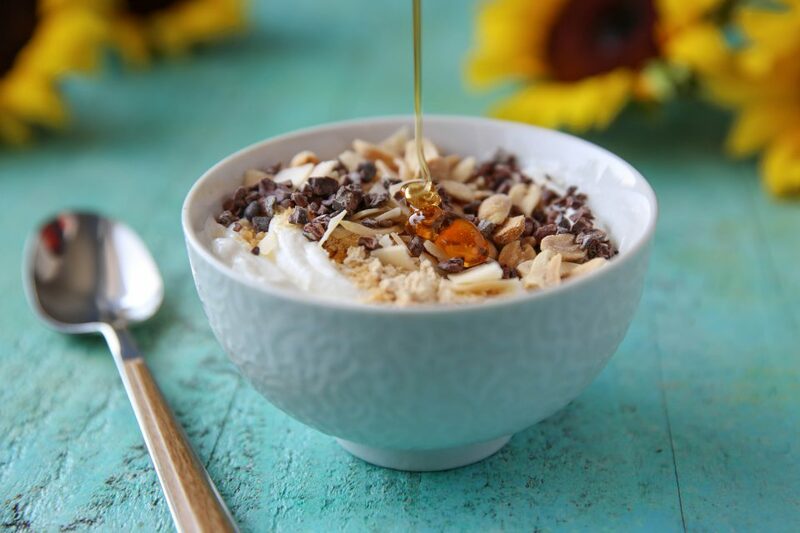 So let’s kick National Honey Month off together with one of my easy recipes! Can’t wait to hear which one is your favorite! I love love this honey! I always buy mine from Sam’s club and yes been into yogurt bowls a lot too lately hehe!! 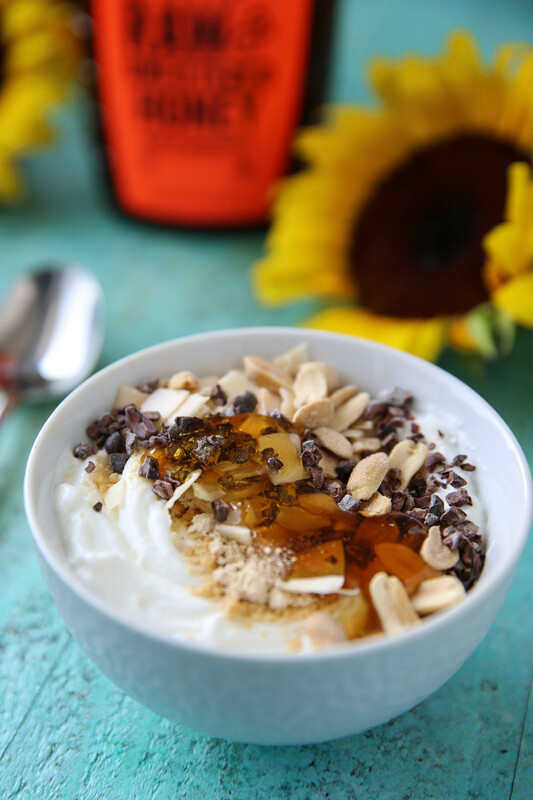 I like to top my homemade yogurt with this honey and granola! Loved the coffee recipe, and love your vanilla bean sweet cream coffee and mocha coffe recipes too! Have never made a bad recipe of yours – keep up the great work! The honey industry is so interesting to me, but if you wanted a good documentary I highly recommend checking out Rotten on Netflix and its a season looking at different industries and the first one is honey and I was FASCINATED! Its quick, only an hour each episode. Really interesting stuff. I will use Nature Nate honey and will never buy honey unless I can verify it is made by American bees. Have you ever made Larabar type bars before? I would love to try and make my own and was looking for a great recipe! Thanks! I’ll take a look at your recipes for the energy balls. Also, thanks for putting out all the great content— much appreciated! Have you found a dairy-free yogurt that doesn’t contain sugar? Dairy makes me miserable. I miss yogurt, but I don’t want one with sugar in it.